Midwest Home is dedicated to showcasing fine homes and gardens in the Twin Cities and around Minnesota. 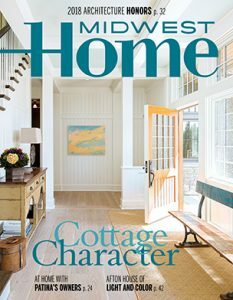 Six times each year, Midwest Home magazine inspires its readers with design trends, entertaining ideas, tips from decorators and gardeners, and features on new homes and renovations. The print magazine has been recognized with numerous awards for its fine editorial content and beautiful design over the years by the Minnesota Magazine & Publishing Association Excellence Awards. To subscribe to the magazine, please visit our online store. The pages between the covers of Midwest Home magazine (except for any inserted material) are printed on paper made from wood fiber that was procured from forests that are sustainably managed to remain healthy, productive and biologically diverse. Greenspring Media publishes Midwest Home and Minnesota Monthly, as well as several local and national titles. In addition to publishing, Greenspring has a special events division that facilitates signature local events including the popular Food & Wine Experience, GrillFest, and Luxury Home Tour. To subscribe to our regular email newsletters, please sign up here. To learn more about opportunities to advertise in print or online, or to inquire about event sponsorship availability, please contact us.